When you put on your Mass & Slim waist shapewear you’ll achieve an immediate slimming effect. The specially contoured panels of this belt will shape your waist, stomach and hips into a perfectly smooth hourglass shape. The elastane in the slimming material will ensure that it’s comfortable to wear all day, with just the right balance of stretch and compression. As it’s worn between your chest and hips, the belt is a discreet way to look slimmer in anything you want to wear – tops, blouses or dresses. What makes Mass & Slim shapewear unique are its long term benefits. The special Tourmaline beads that are encased in the fabric increase your skin’s temperature – this causes your circulation to speed up, allowing for faster irrigation of fat cells. Tourmaline also has a micro-massage effect on your skin, increasing your lymphatic system’s circulation. This is the process that flushes excess fluid and waste products from your body, so speeding it up will drastically reduce bloating and cellulite. 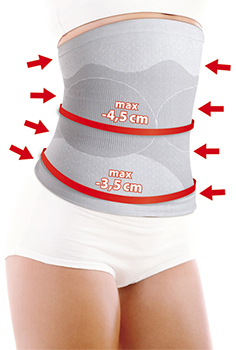 These figures show that if you wear your Mass & Slim belt as directed you are sure to see fantastic results. Available in sizes Small to XL, the belt is hand washable for easy maintenance. Smoothing and slimming the waist. Reducing cellulite.